Chicken Parmesan is a classic Italian recipe that is a staple in my house. How can you go wrong with cheese, sauce, breaded chicken and pasta? With your calorie count you can go wrong!! 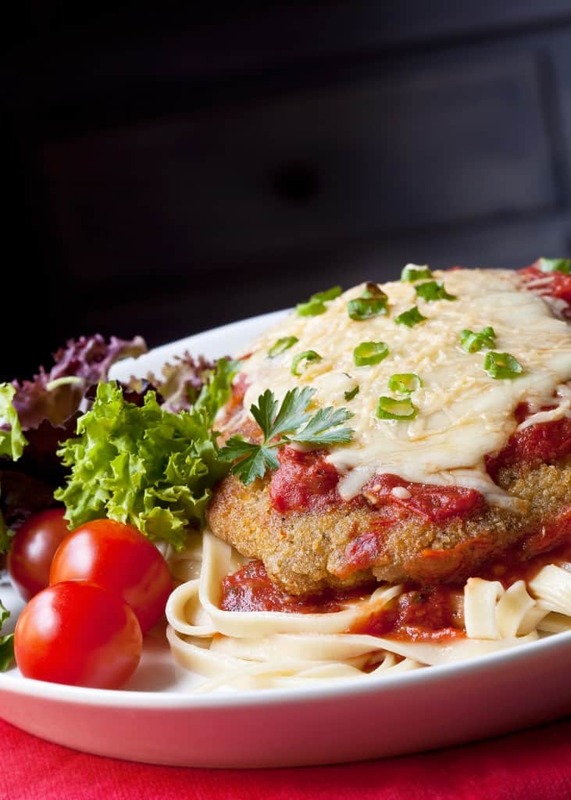 Olive Garden’s chicken parmigiana is loaded with 49 fat grams and has over 1090 calories for the dinner portion. Instead of having an overpriced unhealthy meal why don’t you try cooking this Lighter Chicken Parmesan at your home. With a few different changes in your ingredients and baking instead of frying you can save yourself hundreds of calories. Enjoy with a large salad and skip the pasta to save even more calories. Now use two dishes that you can dredge the chicken in. In one dish whip the 1 egg white. In the other dish put panko, parmesan, Italian seasoning and garlic powder mix it together. Place the chicken into the egg white and make sure to cover the chicken in it. Next put into the panko mixture and make sure to coat the chicken with mixture. Repeat for second breasts. Get a baking sheet and place foil on it (makes it easy clean up) spray with cooking spray. Place both chicken breasts on the cooking sheet. Spray both breasts with a light dusting of spray butter or cooking spray to make the panko crunchy. You can also use a wire rack to make the chicken crunchy on both sides. Place in the oven for 20 minutes. While the chicken is baking cook the pasta as directed on the box. Also heat the pasta sauce in a sauce pan over low heat to stop the splattering. Once the chicken is cooked and the pasta is cooked. Place a ½ cup of pasta on the plate, place chicken on top and drizzle the sauce over the pasta and chicken.